At this point it barely raises eyebrows when TAC, desperate to deflect attention from its own scandals, invents an enemy and lashes out. Such behavior has become typical of President Seth Chagi and his entourage, to the point that it generally isn’t worth the effort to report on. However, when the opponent the flailing “Community” chooses is a widely beloved military Non-Profit, the situation becomes one worth special scrutiny. This becomes even more the case as TAC’s indictment and prosecution cease to be simply outrageous and become absolutely baffling. Early last week, TAC’s then Religious Director Darren Taylor posted an ad for his upcoming book release. Since the contents of that ad and the subsequent disastrous handling of the incident by TAC’s leadership are the focus of a separate article that is still in production, we won’t bog down into the details here. We’re going to be using the word “baffling” a lot in these articles. The reaction to Mr. Taylor’s post was immediate and severe. Posts across the spectrum of online Heathen presence became vitriolic in criticism, both of Mr. Taylor personally and of his continued position at the head of TAC’s Religious development. In characteristic fashion, President Seth Chagi set to work immediately. Instead of valiantly defending women, chastising their objectification, and condemning Taylor though, the embattled President responded by deleting any comments in spaces he controlled that raised even polite criticism. To say that The Asatru Community’s leadership failed spectacularly in handling the debacle is so much of an understatement as to ring of satire. After witnessing the egregious lack of professionalism in this matter, and indeed still rankling from the incident’s origin as a blatant act of misogyny, military Non-Profit Open Halls Project released a statement indicating that they would no longer support TAC in any way. 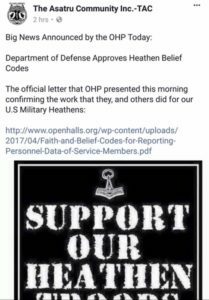 Explicitly, the statement by OHP clarified that no members of The Asatru Community would suffer any loss of support; the Open Halls Project neither dictates the ideologies nor affiliations of the veterans it has promised to aid. Instead, OHP would refuse to engage TAC directly, share material written by the leadership, or support TAC lead activities. On the face of it, this is non-event. Businesses, especially those with differing foundational ideologies, enact these sorts of policies all the time. Perhaps it’s a bit of a ding against TAC’s already flagging gefrain, but otherwise it’s not exactly press-stopping news. That is unless, of course, TAC’s handling of the situation is even more inept than usual. 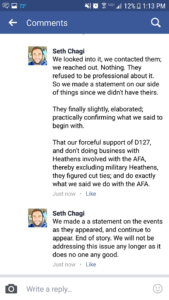 Within minutes, an official response landed on TAC’s Facebook page. Far from the politic acceptance and sadness one might expect such a response to include, the post instead sought to exonerate The Asatru Community by condemning OHP. The chosen vehicle of this exceptionally bizarre attack was OHP’s supposed refusal to support Declaration 127, a wide reaching anti-racist propaganda piece penned months earlier. Since Open Halls Project was not a signatory of the document, TAC’s leadership jumped at an opportunity to connect OHP’s condemnation of them to anything other than their own poor behavior. It took seconds for TAC’s new ship to spring fatal leaks. With a characteristic flare for dramatic but hilariously ill informed reactivity, the leadership had committed an all too common error: they had issued a scathing indictment of a foe without having done any due diligence whatsoever. They hadn’t attempted to reach out to OHP for clarification. They hadn’t sought to understand what had led to the Project’s decision. They hadn’t even taken the time to find out who the leaders of the Open Halls Project are, information that is readily available via google search. Josh and Cat Heath, founders of OHP, are notorious in the Heathen-sphere for their work to combat bigoted ideology. This isn’t just true of racism; indeed the Heaths’ many projects across the fields of Heathenry, Role-Playing Gaming, Nerdery in general, and in their daily life seek to expose and defy misogyny, trans- and homophobia, ableism, and exclusion of just about any stripe. Whether or not you agree with the Heaths in their particular views, it’s ludicrous to attempt to paint them as bigots. 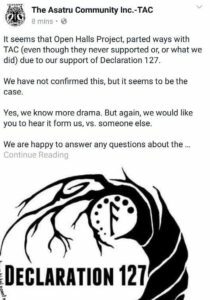 For anyone who has read both Declaration 127 and the Open Halls Project’s Mission Statement, their refusal to sign is for reasons that are both wise and patently obvious. Due to the wording of the document, Open Halls would stand in violation of the pact unless they agreed to cut all support of veterans who belonged to the AFA, regardless of their personal racial beliefs. This is antithetical to the promises OHP has made to Heathen vets. Even so, the Open Halls Project is clear that it does not support explicit bigotry of any kind. Proven communication or behavior of a virulently racist, sexist, homophobic, heterophobic, transphobic, anti-Semitic, or otherwise bigoted manner, shall be grounds for expulsion from the Project. Further, the Heaths themselves are both signatories of Declaration 127. Their Kindred, Great Valley, is a signatory of Declaration 127. The ADF, to which Mrs. Heath belongs, is a signatory of Declaration 127. To even attempt to portray Open Halls Project as racist is beyond laughable; It’s libel. Unless TAC’s next move is to apologize, categorically, and issue an unqualified retraction, it’s obvious that things are going to get a lot worse for them. TAC’s by now infamous tactic is to indict a group or individual and then immediately block them from commenting on the accusation. This allows Seth Chagi to indulge his peculiar obsession of strict message control, while further denying the accused any ability to rebut within easy view of TAC’s ever-shrinking echo chamber. In this incident, however, it seems that they didn’t react quickly enough. OHP was able to respond to the official announcement. 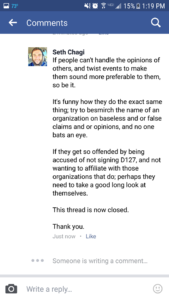 With smart brevity, Josh Heath rebutted that the charge was false, and that the founders of the Project were themselves signatories of Declaration 127. To any observer, TAC’s necessary course was clear.Even so, the leadership decided to escalate rather than soothe the situation. Cryptically, in response to the evidence given by Mr. Heath specifically denying it, TAC’s official response claimed that “..the evidence support[ed]…” their claim. In response, OHP asked for the evidence to be laid out, a request to which TAC eagerly (and foolishly) complied. It all came down to clicks on social media. While it may absolutely boggle the mind of a rational person, a Federally registered Non-Profit had just publicly accused a veteran’s organization of explicit racism based solely on the premise that a single well-known racist clicked “Like.” That was, by TAC’s own admission, the entire basis of their case against OHP. “OPH[sic] only reasoning for ‘stopping supporting us'[sic] was to cite our ethical and moral values did not line up. When we asked to elaborate you refused. Except, of course, that it isn’t interesting in the least. It isn’t even tangentially relevant. The idea that a Facebook “like” on an open group is somehow evidence of conspiratorial collusion is so absurd as to be surreal. It’s such an outlandish argument that it defies attempts at rational contradiction. It’s insane. TAC’s accusations were made no less indefensible by the fact that even that unhelpful evidence was not true. 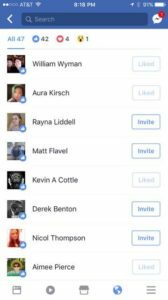 Matt Flavel, the AFA’s Alsherjargothi, had not in fact “liked” Open Halls Project’s announcement. No member of the AFA’s Witan had. As is the case with every piece of false information TAC has spread in the last few days, this too is easily verifiable. If TAC’s desire was to set their critics reeling, they certainly succeeded in that. Instead of mollifying them with solid arguments, though, they left them speechless out of sheer confusion. No one knew quite what to say. And suddenly, as quickly as the whole thing began, it seemed to be over. 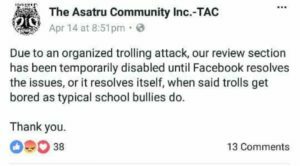 Someone in TAC’s leadership had purged the statements, deleting anything on The Asatru Community’s site that referenced the ongoing argument with Open Halls. TAC had entered scrub mode, and was furiously moving to shred the evidence. It seemed that the leadership at The Asatru Community had regained control of whichever errant member had been running amok, and done the only damage control left available to them: total signal shut down. Certainly, one might expect that TAC would release a retraction of their libelous and inaccurate accusation as soon as they were able to piece things back together. The next morning, they did just that. Only, in the span of a few sentences, they apparently unretract the retraction. “We retract our earlier statements about them because we wanted to be done with this. It’s childish, and we want no part. At this point, we’ve run out of words to describe their behavior. To say that it is nonsensical lacks the aneurysm-exploding reality of it all. Within a handful of hours, TAC had levied damaging charges of racial exclusion against Open Halls, cited an untrue and completely irrelevant point as their only evidence, deleted the entire interaction from their site, posted an ostensible apology, and simultaneously levied the same accusation again. Finally, TAC’s leadership capped the entire incident with what can only be described as a hilarious misunderstanding of US defamation law. Having almost certainly seen that OHP had consulted a Non-Profit attorney regarding the situation, TAC’s “final statement” included an explicit defense. Except that, as any person with a shred of sense can tell you, libel law doesn’t work that way at all. In fact, one of the most important pieces of a libel suit is that the plaintiff must prove that “a reasonable person might believe” the defamatory statement. In stating that they themselves believe the charge, TAC has literally thrown out the one defense they may have had: that the accusation was so ridiculous as to be unbelievable. True to form, Seth has locked down any attempt at criticism. But he can’t block everyone everywhere. You can’t stop the signal, Seth. 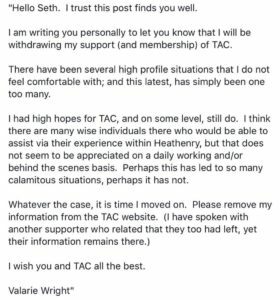 Looks like Valerie Wright, who will herself become a subject of future articles, has cut contact with TAC over these issues. Ever feel like you’re bailing water from the Titanic with a thimbel? Sometimes, it’s ok to say that you were wrong. We have since received screenshots that show that Mr. Flavel had in fact done so, but had “unliked” the post before we were able to see it. We regret our misinformation, though we feel confident that our error doesn’t damage the argument in the least. As a side note: THIS IS HOW YOU ISSUE A RETRACTION. It seems that, even though TAC has only just finished decrying OHP as racists and brigands, they’re nonetheless willing to attempt to ride their coattails to attention! TAC has absolutely nothing to do with the work OHP has done to make this happen, but they sure do seem enthusiastic to make it seem that way! 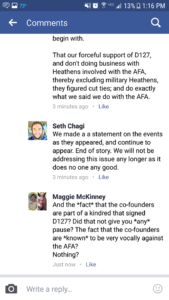 For reasons that we can’t begin to understand here at TACwatch, Seth is still trying to push the narrative that OHP is associated with the AFA. Even when his own group is calling him on it, Seth can’t let well enough alone. Way to go, Seth! Never let a message slip away from you! Control it with all your might! Want to tell TAC how you feel? Visit their helpful new anonymous report form. Want to express your feelings in an open forum? Please feel free to show your disagreement with us by leaving them a glowing review.